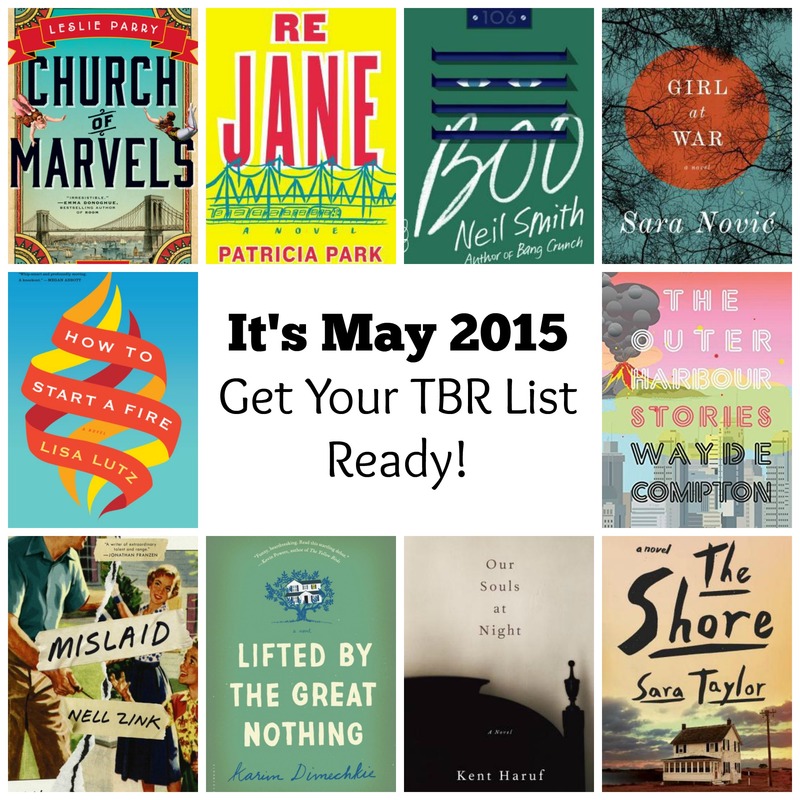 It’s May 2015, Get Your TBR List Ready! It’s a new month! Warmer weather (hopefully) on the horizon, more time spent outdoors, the last month of school (eek) and for us bookish types, new releases to get excited about. For those of you just showing up, I like to write a monthly post about books I am looking forward to. Almost finishing my first year working in a public library, I’ve found that it’s all about supply and demand, like most consumable items. With books, sometimes the lesser known or debut authors don’t get much shelf space, if any. I get it. But I’m also here to remind readers to request, request, request what you love or hope to read! That being said, I am a total fangirl when a favorite author returns with their latest book. I know for many readers there is anticipation this month for Kate Atkinson returning with a companion to Life After Life following younger brother Teddy titled, A God in Ruins. My feelings are still uncertain about Life After Life, since I am just reading it right now for a book group, but I know her fans are excited and multiple copies will be ordered and lining the shelves. Church of Marvels – Leslie Parry (May 5) 320p. This debut novel is set during the turn-of-the-century in New York where four lives intersect from different origins: the seashore, an asylum, a human circus and tenement houses. Sounds weird and wonderful! Re Jane: A Novel – Patricia Park (May 5) 352p. I’m always on the lookout for a modern retelling or reimagining or sequel to a classic I loved. This debut is a modern retelling of Jane Eyre with a Korean American orphan as the heroine. Boo – Neil Smith (May 12) 320p. This debut YA novel sounds appealing to all readers following a thirteen-year-old boy who is the victim of a school shooting in the afterlife. There he meets other fellow victims and possibly the shooter. Love the cover! How To Start a Fire – Lisa Lutz (May 12) 352p. I haven’t read any of Lutz’s The Spellmans mystery series but this Women’s Lit story following three unlikely friends in college who happen upon each other one fateful night, sounds like it might be a good book group pick. Mislaid: A Novel – Nell Zink (May 19) 256p. “A sharply observed, mordantly funny, and startlingly original debut from an exciting, unconventional new voice, about the making and unmaking of the American family that lays bare all of our assumptions about race and racism, sexuality and desire.” So excited for this one! Lifted by the Great Nothing – Karim Dimechkie (May 19) 304p. After emigrating from Beirut to New Jersey, Max’s father Rasheed, want to completely immerse themselves in American culture and give Max the happy childhood he dreams of. At seventeen, Max learns about his father’s lies and returns to Paris and Beirut to find out about his past. Another debut! Our Souls at Night – Kent Haruf (May 26) 192p. After years of being alone, senior widowers Addie and Louis find each other to share their worries and triumphs during the final chapters of their lives. Haruf died last year and this was his last novel. I’ve always wanted to pick up A Tie That Binds and his Plainsong series but never have. Looking forward to starting with this one. The Shore – Sara Taylor (May 26) 320p. “Welcome to The Shore: a collection of small islands sticking out from the coast of Virginia into the Atlantic Ocean. Where clumps of evergreens meet wild ponies, oyster-shell roads, tumble-down houses, unwanted pregnancies, murder, storm-making and dark magic in the marshes. . .” I’m hearing this debut is interconnected Short Stories, Literary Fiction, Historical Fiction, an opening that wows and a novel that readers won’t soon forget. Yep, I lost restraint and requested this one. What new releases are you looking forward to in May 2015? Tags: Historical Fiction, Kent Haruf, Leslie Parry, Lisa Lutz, Literary Fiction, May 2015 debut authors, May 2015 new releases, Neil Smith, Nell Zink, Patricia Park, Sara Novic, Sara Taylor, short stories, Wayde Compton, Women's Lit, young adult. Bookmark the permalink. This post gets me all excited in so may ways. First of all, I have never done a monthly TBR. You are a genius. I’m going to try it. Second, I am in the middle of How To Start a Fire right now and it is magnificent. But keep a pen and paper handy. You’ll see why. Third, Kent Haruf. So sad we’ve lost him. I want to read this book so much, and yet part of me just wants to wait a while so I’m not done with his work forever. Finally, I’m looking forward to Boo very much and am on my library’s wait list. Girl at War is also on my radar. You’ve brought some others to my attention I didn’t even know about. You definitely steered me right with Shell Collector, so I’m going to follow any further short story recs you have, looking forward to hearing about Outer Harbor. As a total cover nerd, I’m intrigued by Mislaid, ’cause that cover rocks. Thanks! I don’t necessarily READ all these wonderful new books but I want my library to stock them so I can some day! 🙂 so excited that you are liking Fire…it sounds good. Girl at War and The Shore are at the TOP of my TBR this month! I was really hoping for the e-ARC of Boo, but I must not be cool enough yet ;). A few others you’ve mentioned I will have to investigate. Really exciting you’ll be on The Socratic Salon this month, and I’m looking forward to your thoughts! I’m small potatoes so I don’t get very many ARCs but hopefully my library will get these! I can’t wait to talk about A Little Life. It really struck a nerve. I know it’s confusing. On Edelweiss they called The Wallcreeper a Novella and Mislaid an original debut novel. Anyway, I’m still looking forward to reading it since I never read Wallcreeper. Did you like it? I have mixed feelings! I mean I really liked it. It was funny and well written and very strange. But I don’t know if it was objectively good? Or. I don’t know. I can’t figure out words for it haha. It’s definitely bizarre in topic and structure. Re: Jane sounds great and I haven’t heard of it. Must keep my eye open for it. And I’m also looking forward to the Lisa Lutz. I’ve read the Spellman series and found them quirky and fun.